Copper alloy consists of 44.06-49.08 wt.% Cu, 2.4-2.58 wt.% Ni, 4.21-3wt.% Zn, 3.6-3.4 wt.% Al, 3.6-3.4 wt.% Sn, 30-28 wt.% Au, 1.5-2 wt.% Pd and 10-7 wt.% Ag. The alloy is obtained by adding 28-30 wt.% Au, 1.5-2 wt.% Pd and 7-10 wt.% Ag into 58.5-63 wt.% third alloy melts, and heating at 1200 deg.C for 5 minutes. The third alloy melt is obtained by heating at 900-1200 deg.C for 1hr the mixed melt of 87-95 wt.% first alloy melt, consisting of 5-22 wt.% Ni and 78-95 wt.% Cu, and 5-8 wt.% second alloy melts consisting of 40-60 wt.% Zn, 20-30 wt.% Al and 20-30 wt.% Sn. 본 발명은 인류생활중에 미적추구욕을 만족하기 위하여 고대로부터 귀하게 여겨온 금과 은의 색상을 변색없이 오래도록 나타내는 금은색 장식용 구리(Cu) 합금 및 그 제조방법에 관한 것이다. The present invention relates to the ear seen from ancient on gold and gold-silver decorative copper (Cu) alloy and a method of manufacturing a long time without color change that indicates the silver color in order to satisfy the aesthetic pursuit bath during human life. 종래부터 금과 은은 귀금속으로서 색이 안정되고, 변질이 없이 우아한 미적가치성 때문에 애호되어 왔고 그 모조를 위한 연구도 활발하였던바, 그 첫째 수단은 금과 은을 직접구리에 도금하는 것은 가격이 너무나 고가이고 또한 통상적으로 얇게 도금하기 때문에 사용도중에 그 두께가 얇아 벗겨지기 쉬워서 얼룩이 나타나고, 또한 벗겨진 부위와 원래의 부위와의 색상이 달라 귀금속으로서의 가치성을 인정받지 못했으며, 그 둘째수단으로는, 알루미늄(Al) 분말등에 착염한 안료를 투명도료에 혼합하여 도장하는 방법과, 은백색 물체위에 직접 금, 은색 염료를 착색한 투명도료를 도장하는 방법이 있으나 이것들 역시 실제 금, 은과는 현격한 질감은 차이가 있어 저렴한 장식물에 사용되어온 정도이었고, 셋째 수단으로는, 납(Pb)을 구리(Cu)에 첨가하여 금 The color is stable as a conventional gold and silver precious metals been altered is protection because no elegant aesthetic gachiseong bar who also active research for its imitation, the first means is for plating the copper with gold and is directly too high price and in addition, during the use because the conventional thin plating as appears dirt liable to be peeled thinner in thickness, and changes the color of the peeled portion and the original portion of it did not recognize the noble metal gachiseong as, the second means, the aluminum (Al ) a method of coating a mixture of a complex salt pigments such as powder in a transparent coating material with, but a method for coating the transparent coating directly color the gold, silver dye on silver-white objects they also actual gold, silver has a sharp texture is different from the There was a degree which has been used at the best the ornament, and the third means is, by the addition of lead (Pb) in copper (Cu), gold 을 내는 방법으로 제조한 합금도 출현한 바 있으나, 이 역시 쉽게 변색이 되고 독성이 심하여 인체용 장신구로서는 부적합하였다. The alloy, but also occurrence bar produced by the process that, this was also not appropriate as easy to be discolored severe toxic for human ornaments. 또한 금-은-파라디움(Au-Ag-Pd)계 합금으로서 내식성이 높고, 변색이 없고, 주조성 및 가공성이 우수하여 치과용 재료로서 적합한 합금이 특허공고 제86-66호로서 공고 되었으나 이는 고가의 금(Au), 은(Ag) 및 파라디움(Pd)를 주성분으로 하였기 때문에 가격이 고가이여서 인체용 장신구로서 다량 사용하기에는 부적합하여 사용범위가 극히 제한되는 등의 결점이 있었다. In addition, the gold-silver-paradium (Ag-Pd-Au) with high corrosion resistance as the base alloy, there is no color change, but this alloy is suitable as dental materials is excellent in castability and machinability Patent Publication No. 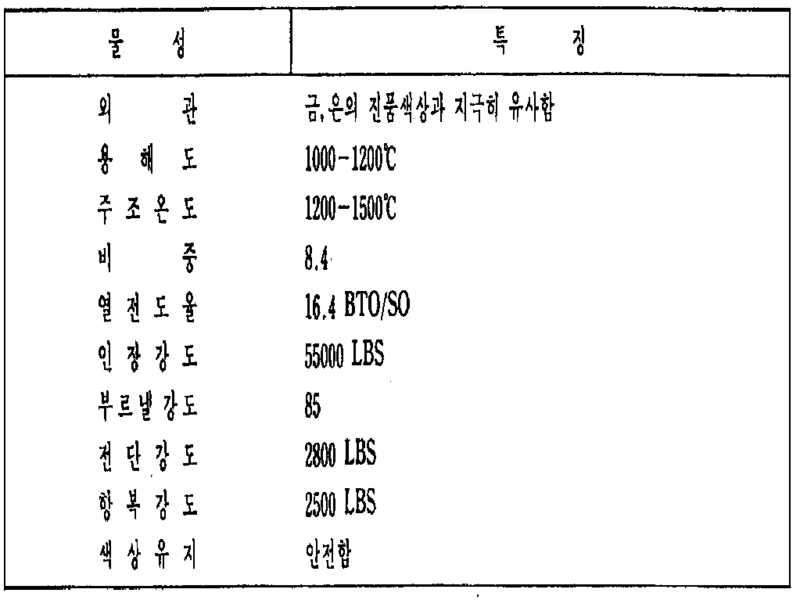 86-66 as a notification that high of gold (Au), was a disadvantage such as to be suitable to use a very limited range hagieneun much used (Ag) as a main component, and because a paradium (Pd) yiyeoseo the price is high as ornaments for the human body. 본 발명은 상기와 같은 결점이 없고 저렴한 가격으로 인체에 무해한 금, 은색을 나타내는 장식용 구리합금을 제공하기 위한 것으로 특히 본 발명은 합금자체로 원하는 제품의 전소재를 제조할 수 있게 함으로서 금, 은과 같이 반영구적으로 사용할 수 있게 하기 위한 금, 은색 장식용 구리합금과 그 제조방법을 제공하는데 그 목적이 있는 것으로서 이하에서 본 발명을 구체적으로 설명하면 다음과 같다. Gold present invention In particular, the present invention as to provide a gold ornamental copper alloy representing the silver is harmless to the human body with no defects low price as described above, by enabling to manufacture the entire material of the product desired in the alloy itself, is the as if the purpose is described in detail the invention as hereinafter that provides a gold, silver decorative copper alloy and its manufacturing method to be available permanently as follows. 즉 본 발명에서는 내산화성이 강하고 산화되어 녹이난다고 해도 본연의 색상을 그대로 유지하는 니켈(Ni)과 구리(Cu)로 합금을 조성합금화하고, 치밀한 금속결정에 의하여 우아한 귀금속색과 광택을 유지하며 금속합금착색이 잘되는 아연(Zn)과 알루미늄(Al) 및 주석(Sn)을 조성합금화하여 전자의 니켈(Ni)과 구리(Cu) 합금량이 후자의 아연(Zn)과 알루미늄(Al) 및 주석(Sn) 합금량보다 많은 비율로 혼합합금할 경우에 있어서는 14K, 18K 등의 합금색에 가까운 색상이 나타나는 합금체가 되고, 상기한 후자를 전자보다 적은 비율이기는 하나 어느정도 많은 비율로 혼합합금을 만들 경우에는 은색(銀色)의 색상을 나타내는 장식용 합금체가 되게하는 한편, 이 합금체에 Au, Pd, Ag 등의 귀금속을 5wt% 이상 조성합금함에 따라 변색이 없이 더욱 진품에 가까운 금, 은 색상을 That is the present invention, the oxidation resistance is strong and is oxidized rust nandago even compositions alloying, maintain elegant noble metal color and gloss by the dense metal determine the alloy of nickel (Ni) and copper (Cu) to maintain the natural color intact and metal alloy coloring the well-zinc (Zn) and aluminum (Al), and tin (Sn) is the composition alloy and the amount of the electroless nickel (Ni) and copper (Cu) alloy, the latter zinc (Zn) and aluminum (Al), and tin (Sn ) if, in the case to the alloy mixture with a high proportion of more alloy amount and body alloy is a color close to the alloy color of 14K, 18K, etc. appear, albeit the one latter small proportion than the former create a mixed alloy with somewhat large ratio is silver gold close to the real thing without further discoloration as (銀色) color decorative alloy to be the other hand, the Au, Pd, an alloy composition of at least 5wt% of the noble metal such as Ag in the alloy member to the body is shown, is the color 나타내도록하기 위한 것으로 이하에서 본 발명을 좀 더 상세히 설명하면 다음과 같다. If a more detailed description of the present invention hereinafter to be to indicate as follows. 즉 금색의 광택을 지닌 본 발명의 장식용 구리합금의 조성비는, 구리(Cu) : 67.86-77.9%, 니켈(Ni) : 19,14-4.1%, 아연(Zn) : 7.8-7.2%, 알루미늄(Al) : 2.6-5.4% 및 주석(Sn) : 2.6-5.4%로 조성되어지는 것으로서 이는 다음과 같은 공정을 거쳐서제조가능하다. I.e., the composition ratio of the decorative copper alloy of the present invention having a gloss of gold, the copper (Cu): 67.86-77.9%, nickel (Ni): 19,14-4.1%, zinc (Zn): 7.8-7.2%, aluminum ( Al): 2.6-5.4%, and tin (Sn): as being in 2.6-5.4%, this composition can be produced through the following process. 니켈(Ni) : 5-22%, 구리(Cu) : 95-78%를 목탄분말 주입하에 1200℃로 1시간 가열하여 용융된 제1차 용융금속합금체 82-87%에 아연(Zn) : 40-60%, 알루미늄(Al) : 30-20%, 주석(Sn) : 30-20%를 목탄분말 주입하에 600℃로 30분간 가열하여 용융된 제2차 용융금속합금체 18-13%를 혼합하여 900℃-1200℃에서 1시간 가열하여 얻어진 제3차 용융금속 합금체가 상기와 같은 금색의 광택을 지닌 장식용 구리합금을 얻을 수 있으며, 상기에서 용융되는 제1차 용융금속 합금체에서 니켈(Ni) : 5-22%를 조성사용하게 되는데 이는 내식성을 유지함에 있고 특히 5% 이하에서는 내식성을 유지하기에는 극히 어렵고 22% 이상이면 목적결과물에서 금색의 광택을 지니지 않게된다. Nickel (Ni): 5-22%, copper (Cu): subject to the 95-78% 1 hours and heated to 1200 ℃ under charcoal powder injecting molten zinc in the primary molten metal alloy material 82-87% (Zn): 40-60%, aluminum (Al): a 30-20% the second molten metal alloy material 18-13% melted by being heated for 30 minutes at 600 ℃ under charcoal powder injection: 30-20%, tin (Sn) mixing may be obtained for the decorative copper alloy having a golden gloss of the body, such as the third molten metal alloy obtained one hour heating at 900 ℃ -1200 ℃, nickel in the first molten metal alloy that melts at the body ( Ni): there is used a composition of 5-22% which is extremely difficult if not more than 22% and corrosion resistance in maintaining hagieneun in particular 5% or less for the purpose of maintaining the corrosion resistance results boatman luster of gold. 구리(Cu) : 95-78%를 조성사용하게 되는데 이는 용해금속의 유동성과 합금의 연질성을 높혀주는데 있으며 특히 78% 이하에서는 목적결과물에서 금색의 광택을 지니지 않게된다. Copper (Cu): there is used a composition of 95-78% which is not juneunde nophyeo the softness and flowability of the molten metal alloy, and in particular 78% or less boatman luster of the gold in the resulting object. 상기에서 용융되는 제2차 용융합금체에서 아연(Zn) : 40-60%를 조성사용하게 되는데 이는 융점을 저하시키고 또한 제2차 용융합금체가 목탄분말 주입에 따라 발생되는 CO 2 가스에 의하여 불활성 상태가 유지되도록하여 산화물의 생성을 막는것과 함께 탈산작용을 유도함에 있다. In the second molten alloy body is melted in the zinc (Zn): there is a 40-60% using the composition, which also lower the melting point and the second molten alloy body charcoal powder by the CO 2 gas generated in accordance with the injected inert to ensure that state is maintained is a deoxidizing action, along with preventing generation of oxide to induce. 특히 목적결과물에서는 7.8-7.2%로 합금조성되어지는데 이는 결국 제2차 용융금속 합금체를 용융할때에 상기와 같은 목적에 입각하여 행하여지나, 함량이 전체적으로 많아지면 내식성이 감소하고 특히 10% 이상 함유하게 되면 목적결과물의 광택이 극히 혼탁된다. In particular, the composition of the alloy is makin to 7.8-7.2% which in turn results purpose the second molten metal when the molten alloy body beyond performed on the basis of the above object, the content is increased when the corrosion resistance is reduced as a whole, and in particular more than 10% If the purpose of containing the gloss results are extremely cloudy. 알루미늄(Al) : 30-20%를 조성사용하게 되는데 이는 30% 이상이 되면 조성합금용융시 발생하는 산화에 의하여 유동성이 해치게되어 합금속 조직이 파괴되고, 또한 산화물개재(介在)에 의하여 목적결과물에 불량이 발생하게 되며, 20% 이하가 되면 용융상태에서 급속이 냉각해야하는 단점을 배제함에 있다. Aluminum (Al): there is used a composition of 30-20%, which is above 30% the metal structure must be spoiled by the liquid oxide generated during melt alloy composition are destroyed, is also an object output by the interposed oxide (介 在) a defect is generated in, if not more than 20% can eliminate the drawbacks as the need to rapidly cool the molten material. 주석(Sn) : 30-20%를 조성사용하게 되는데, 이는 상기와 같이 제한함으로서 용융시에 용탕의 유동성을 양호하게 하고, 강도를 증가시킴과 동시에 용탕중에 CO가스 생성반응에 의한 기포의 발생을 방지함과 목적 결과물에서 10% 이상 함유하게 되면 내마모성, 내부식성은 있으나 가공성이 극히 나빠지는 단점이 있게된다. Tin (Sn): there is used a composition of 30-20%, which is the generation of air bubbles due to the CO gas generated during the reaction, and preferably by limiting the flow of the molten metal during melting, increasing the strength Sikkim and at the same time the molten metal as described above, When the box and prevent the object not less than 10% results in abrasion resistance, corrosion resistance, but it is possible the disadvantage that workability is extremely poor. 한편 은색의 광택을 지닌 본 발명의 구리합금 조성비는 구리(Cu) : 67.86-74.1%, 니켈(Ni) : 19.14-20.9%, 아연(Zn) : 7.8-3.0%, 알루미늄(Al) : 2.6-1% 및 주석(Sn) : 2.6-1%로 조성되어지는 것으로서 이는 다음과 같은 공정을 거쳐서 제조가능하다. The copper alloy composition of the present invention having a gloss of a silver copper (Cu): 67.86-74.1%, nickel (Ni): 19.14-20.9%, zinc (Zn): 7.8-3.0%, aluminum (Al): 2.6- 1%, and tin (Sn): 2.6-1% as being a composition which can be produced through the following process. 즉 상기와 같이 니켈(Ni) : 5-22%, 구리(Cu) : 95-78%를 목탄분말 주입하에 1200℃로 1시간 가열하여 용융된 제1차 용융금속 합금체 87-95%에 아연(Zn) : 40-60%, 알루미늄(Al) : 30-20%, 주석(Sn) : 30-20%를 목탄분말 주입하에 600℃로 30분간 가열하여 용융된 제2차 용융금속 합금체 13-15%를 혼합하여 900℃~1200℃에서 1시간 가열하여 얻어진 제3차 용융금속 합금체가 상기와 같은 은색의 광택을 지닌 장식용 구리합금을 얻을 수 있게 된다. That is nickel (Ni) as described above: 5-22%, copper (Cu): the first time Heating to 95-78% to under 1200 ℃ charcoal powder injection by melting the zinc in the primary molten metal alloy material 87-95% (Zn): 40-60%, aluminum (Al): 30-20%, tin (Sn): a 30 minutes heated to 600 ℃ to 30-20% under the charcoal powder injection by melting the second molten metal alloy body 13 mixing 15% to thereby obtain the decorative silver copper alloy having the gloss of the body, such as a tertiary molten metal alloy obtained is heated for 1 hour at 900 ℃ ~ 1200 ℃. 특히 여기에서는 전자의 것에 비하여 니켈(Ni) 함량의 성분비가 상대적으로 많음을 알 수 있는데 이는 은색의 광택을 내고자함에 있다. In particular, this case is as compared to the component ratio of the electron is nickel (Ni) content there can be seen the relatively plenty naegoja which the gloss of silver. 한편 상기한 공정에 따라 제조된 제3차 용융금속 합금체 58.5-63%에 금(Au) : 30-28%, 파라디움(Pd) : 1.5-2%, 은(Ag) : 10-7%를 혼합하여 목탄분말 주입하에 5-20분간 1200℃에서 완전 용융하여 제4차 용융금속 합금체가 얻어지는데 이는 구리(Cu) :44.67-49.08%, 니켈(Ni) : 2.4-2.58%, 아연(Zn) : 4.21-3%, 알루미늄(Al) : 3.6-3.4%, 주석(Sn) : 3.6-3.4%, 금(Au) : 30-28%, 파라디움(Pd) : 1.5-2% 및 은(Ag) : 10-7%로 조성되는 진한 금색의 광택을 띤 조성결과물을 얻을 수 있는데, 이는 외견상 진품과 같은 광택을 가지게 되므로 훌륭한 금색의 장식물의 원자재로서 사용가능하게 된다. The gold in the third molten metal alloy body 58.5-63% prepared according to the above process (Au): a 10-7%: 30-28%, paradium (Pd): 1.5-2%, silver (Ag) makin mixed with complete melting at 1200 ℃ 5-20 minutes of charcoal powder body injection takes the 4th molten metal alloy which copper (Cu): 44.67-49.08%, nickel (Ni): 2.4-2.58%, zinc (Zn) : 4.21-3%, aluminum (Al): 3.6-3.4%, tin (Sn): 3.6-3.4%, gold (Au): 30-28%, paradium (Pd): 1.5-2%, and silver (Ag) : you can get the composition resulting brownish sheen of dark gold that composition to 10-7%, which therefore have the same luster and apparent rarity is available as an ornament of fine gold raw materials. 여기에서 조성사용되는 금(Au) : 30-28%는 (황)금색도를 높이고 조직을 치밀케하는 데에 있으며, 특히 28% 이하가 되면 이와반대로 미(황)금색으로 변하게 된다. This gold (Au) is used in the composition: 30-28% is in the cake to a dense tissue to increase the degree gold (sulfur), in particular when less than 28% on the other hand is changed to the non-(sulfur) gold. 파라디움(Pd) : 1.5-2%로 조성사용하게 되는데 이는 보통 3% 이상이 첨가되면 금(Au), 은(Ag) 및 아연(Zn)과의 합금작용에서 (황)금색도를 상쇄시키게 되므로 단지 금(Au)과의 은(Ag) 합금에 있어 첨가원소로 사용하게 된다. Paradium (Pd): Since there is used as a 1.5-2% when the composition which is typically over the addition of 3% gold (Au), silver alloy and the action of silver (Ag) and zinc (Zn) (sulfur), thereby offsetting the gold Fig. with only the gold (Au) is used as an additive element in the alloy (Ag). 은(Ag) : 10-7%를 조성사용하게 되는데 이는 10% 이상이 되면 내식성이 감소하게 될 뿐만아니라 특히 아연(Zn)과의 합금작용에서 금색도가 엷어져 엷은(미)색의 금색이 나타날 뿐만아니라 강도 역시 감소하게 된다. Is (Ag): there is be a 10-7% using the composition, which is of the is above 10% not only the corrosion resistance is reduced, particularly becomes a gold alloy in FIG yeopeo action of the zinc (Zn) thin (US) gold color receive, as well as the strength is reduced, too. 또한 상기한 제4차 용융금속 합금체를 제조하기 위해 목탄분말 주입하에 용융하게 되는데 이는 CO 2 가스에 의하여 용융체가 불활성 상태가 유지되도록 하여 산화물의 생성을 방지하면서 완전 용융하는데에 있다. In addition to producing the above-described fourth round of the molten metal alloy material there is melted under charcoal powder which is injected in to the completely melted, while preventing the formation of oxide so that the melt is maintained an inert state by the CO 2 gas. 이와같은 방법에 의해 제조된 본 발명의 평균물설치를 살펴보면 다음의 표 1과 같았다. Referring to this, the average water installation of the invention prepared by the same method was as follows in Table 1. 이와같은 본 발명은 저렴한 생산비에 의하여 제조가능하면서도 외견상의 장식효과는 진품의 금, 은색상과 지극히 유사하므로 귀금속성 장식물등에 효과적으로 공급사용할 수 있는 매우 유효한 발명임이 명백하다. Such a decorative effect on the present invention, yet can be produced by a low production cost, so apparently very similar to gold and silver of the authenticity is obvious that a very effective invention that can be effectively supplied to the noble metal or the like property decorations. 구리(Cu) : 67-86-77.9%, 니켈(Ni) : 19.14-4.1%, 아연(Zn) : 7.8-7.2%, 알루미늄(Al) : 2.6-5.4% 및 주석(Sn) : 2.6-5.4%로 조성되어 금색의 광택을 가진것을 특징으로 하는 금, 은색 장식용 구리합금. Copper (Cu): 67-86-77.9%, nickel (Ni): 19.14-4.1%, zinc (Zn): 7.8-7.2%, aluminum (Al): 2.6-5.4%, and tin (Sn): 2.6-5.4 the composition is a% of gold, characterized in that with the luster of gold, silver decorative copper alloy. 구리(Cu) : 67.86-74.1%, 니켈(Ni) : 19.14-20.9%, 아연(Zn) : 7.8-3.0%, 알루미늄(Al) : 2.6-1% 및 주석(Sn) : 2.6-1%로 조성되어 은색의 광택을 가진것을 특징으로 하는 금, 은색 장식용 구리합금. Copper (Cu): with 2.6-1%: 67.86-74.1%, nickel (Ni): 19.14-20.9%, zinc (Zn): 7.8-3.0%, aluminum (Al): 2.6-1%, and tin (Sn) the composition is characterized in that having a gloss of a silver gold, silver decorative copper alloy. 니켈(Ni) : 5-22%, 구리(Cu) : 95-78%를 목탄분말 주입하에 1200℃로 1시간 가열하여 용융된 제1차 용융합금체 82-95%에, 아연(Zn) : 40-60%, 알루미늄(Al) : 30-20%, 주석(Sn) : 30-20%를 목탄분말 주입하에 600℃로 30분간 가열하여 용융된 제2차 용융합금체 18-5%를 혼합하여 900℃-1200℃에서 1시간 가열하여 얻어진 제3차 용융합금체 58.5%-63%에 금(Au) : 30-28%, 파라디움(Pd) : 1.5-2%, 은(Ag) : 10-7%를 첨가하여 목탄분말 주입하에 5-20분간 1200℃에서 완전 용융하여 얻어진 제4차 용융합금체가 구리(Cu) : 44.69-49.08%, 니켈(Ni) : 2.4-2.58%, 아연(Zn) : 4.21-3%, 알루미늄(Al) : 3.6-3.4%, 주석(Sn) : 3.6-3.4%, 금(Au) : 30-28%, 파라디움(Pd) : 1.5-2%, 은(Ag) : 10-7%로 조성되는 금, 은색 장식용 구리합금의 제조방법. Nickel (Ni): 5-22%, copper (Cu): 95-78% in the first molten alloy body 82-95% for 1 hour and heated to 1200 ℃ under charcoal powder injection of molten zinc (Zn): 40-60%, aluminum (Al): mixture of 30-20% of the second molten alloy body 18-5% melted by being heated for 30 minutes at 600 ℃ under charcoal powder injection: 30-20%, tin (Sn) obtained by heating for one hour at 900 ℃ -1200 ℃ third molten alloy material of gold (Au) on a 58.5% -63%: 30-28%, paradium (Pd): 1.5-2%, is (Ag): 10 was added to 7% by charcoal powder injection the copper (Cu) body quaternary molten alloy obtained is completely melted at 1200 ℃ 5-20 minutes of: 44.69-49.08%, nickel (Ni): 2.4-2.58%, zinc (Zn ): 4.21-3%, aluminum (Al): 3.6-3.4%, tin (Sn): 3.6-3.4%, gold (Au): 30-28%, paradium (Pd): 1.5-2%, silver (Ag ): process for producing a gold decorative silver copper alloy composition to 10-7%. NL8701001A (en) 1988-11-16 Castable palladium alloys and their use for the manufacture of dental restorations, jewelry, etc. CH663035A5 (en) 1987-11-13 Method for manufacturing a golden sintered alloy for decoration purposes.